As usual it's all passed me by, all the Out of Africa - Happy Valley - White Mischief reading that I've never quite got around to. Somehow none of it appealed, the wealthy whooping it up in Africa just didn't interest me. 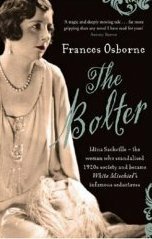 So it was with some trepidation that I picked up Frances Osborne's book The Bolter - Idina Sackville - the woman who scandalised 1920's society and became White Mischief's infamous seductress. Frances Osborne will be speaking about The Bolter at Ways With Words on July 12th and thankfully worked very rapid magic on me with her book about Idina Sackville, her great grandmother. Frances has in fact produced an unmissable and magnificently readable book. Divorce however was still frowned upon and quite a rarity so Idina Sackville set off as she meant to carry on as the child of divorced parents. Already marginalised there seemed little left to lose as Idina threw herself with abandon into the life she chose, a good deal has gone awry by the time she's twenty-five. By page twenty I was nicely esconced on a sofa at the Ritz or was it the Savoy, so you can see how cleverly Frances Osborne entices her reader in. The book steers a careful course through very choppy waters indeed as Idina notches up an unheard of five marriages, but the fall out and any implied social disgrace seemed like water off the proverbial duck's back to Idina who knew what she wanted and needed and made sure she got it. 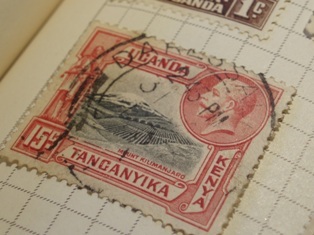 Setting any colonial misgivings aside, Africa seemed the perfect place to settle with its liberating and boundary-less wide open spaces and sense of complete freedom, where Idina famously walked barefoot most of the time.She worked hard managing her farms with varying degrees of success, dependent largely on the quality of the available distractions or lack of them. All this in stark contrast to the stiflingly claustrophobic London society life. Not that Idina wasn't happy with both because each served her needs accordingly. But it's very difficult to be judgemental, even when I expected to be, as Idina leaves her sons behind and heads to Africa for the first time.Within this 'infamous seductress' is a living breathing human being and Frances Osborne treads a very fair and objective pathway, frequently getting to the very heart of Idina in the process, identifying the sources of her insecurities and emotional neediness. There are some teribly sad moments, not least the separation from her children which had me yearning for some degree of reconciliation, and an ultimate and seemingly unjust sadness when I discovered exactly why Idina was barred from attending her own daughter's wedding. Now so many literary avenues have opened I hardly know where to begin. The Pursuit of Love by Nancy Mitford and The Green Hat by Michael Arlen (recently republished by Capuchin Classics) both feature characters based on Idina Sackville. Out of Africa by Karen Blixen seems like another must-read too and I suppose if I want to know more about the scandals, White Mischief by James Fox. This the book which investigates the murder of one of Idina's several ex's and father of her only daughter, the 22nd Earl of Erroll, Jossyln Hay. The Bolter reads very much like a page-turning novel in its own right, a great read and I shall be hanging on Frances Osborne's every word too and will report back.